As the third week of Paperight’s #textbookrevolution draws to a close, we have a lot to be proud of, and a lot of people to thank. All in all, we managed to gather over 400 signatures from Stellenbosch University students and over 600 signatures from students from the University of Cape Town – that’s over 1000 students who love what Paperight is doing for them. On Monday 17 February, the Paperight team visited UCT’s Upper Campus to speak to students about the campaign. We had a lot of smiles and thumbs up. We handed out #textbookrevolution drinks coasters and found out what cheaper textbooks would really mean to students. Overwhelmingly, students insisted that they would buy all their textbooks if they could only afford them. Most students get by with either borrowing from friends who have the book they need, or by photocopying sections that they need at different intervals of the year. Some buy second-hand books – if the previous year’s edition is still prescribed, that is. And who can blame them when the prices are so high? We spoke to a 5th year medical student who has to buy a R2800 textbook, and a future chemical engineer who will be forced to fork out R3000 for one of her 6 prescribed textbooks for their first semester alone. It’s helped us to hear that students agree with the #textbookrevolution campaign, and acutely feel the problems it hopes to solve. Students are desperate for some kind of alternative. Of course, not all the feedback was positive off the bat. 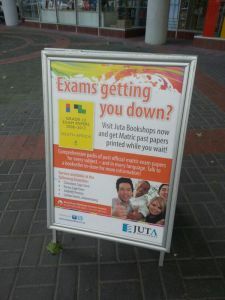 Some students expressed a concern for the future of bookshops – we were happy to explain to them that bookstores have nothing to fear from Paperight. (Bookstores can use Paperight too!) Similarly, some Law students were curious about the legality of the Paperight model – in the end they were convinced by the simplicity of the idea. In the end, everybody wins with Paperight. More supporters are joining the ranks of the #textbookrevolution every day. But don’t just take our word for it! Watch our campaign video to see for yourself. Put an end to unaffordable textbooks. Join the #textbookrevolution. Show your support by liking us on Facebook and Twitter, signing our petition, and using the #textbookrevolution hashtag. Posted on 24 February 2014 21 February 2014 Author Nick MulgrewCategories Uncategorized1 Comment on The #textbookrevolution hits UCT! Manga Shakespeare is now available at all Paperight outlets! Intrigued by these comic book version of the Bard’s plays? So were we. Paperight’s Marketing Coordinator Marie-Louise Rouget takes a look at them here. New sponsor’s and schools guides! 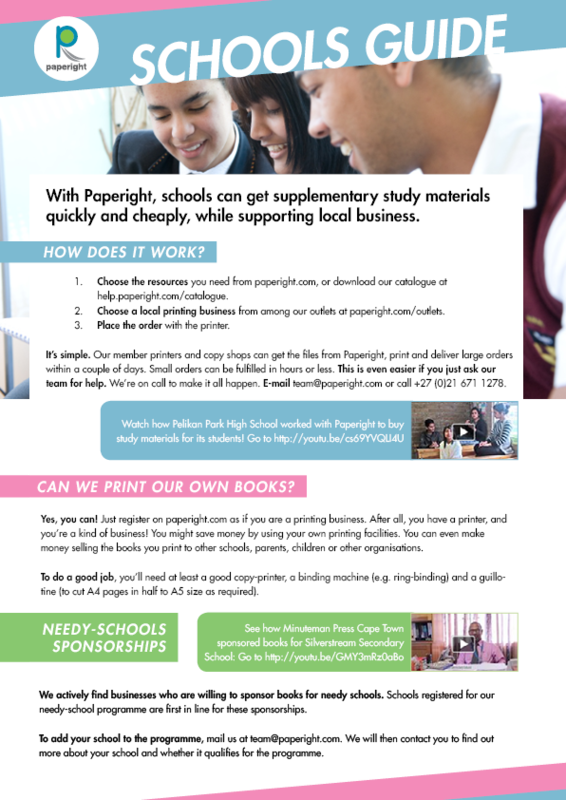 Help sell your Paperight services to schools – and attract sponsors for bulk donations of books – with our new sponsor’s and schools guides. Our guides are quick-and-easy summaries of the benefits that Paperight outlets can bring, whether it’s helping schools get easier, cheaper and more immediate access to books, or helping a business spend their social-responsibility budget on a sponsorship that can make a huge difference to people’s lives. You can find the online version for schools here and sponsors here, and the printed guides version for schools here and for sponsors here. Posted on 13 November 2013 13 November 2013 Author Nick MulgrewCategories UncategorizedLeave a comment on New sponsor’s and schools guides! Posted on 4 November 2013 Author Nick MulgrewCategories UncategorizedLeave a comment on A new product catalogue for Paperight outlets! We’re making sure that we regularly update all of the resources on our Help site to keep them as up-to-date and helpful as possible. We have just upgraded our how-to videos for using paperight.com. For Paperight veterans and newbies alike, let us show you how to do everything you need to know on the Paperight website in four easy to follow videos: registering your copy shop, topping up, downloading and printing a document and changing your account settings. Similarly, our outlet cheat sheet is a great, quick reminder of all the steps that go into downloading a Paperight document. Download it by clicking here and print it out and stick it up next to the computer you’ll be using for downloads. This way, you and your staff will always be ready when a customer asks for a book. Paperight wins at CONTEC Startup Showcase at Frankfurt Book Fair! Paperight is thrilled to announce that we have taken first place in the Contec Frankfurt Startup Showcase, held yesterday at the 56th Frankfurt Book Fair. Contec Frankfurt is a precursor to the Frankfurt Book Fair, the largest book and media fair in the world, with keynote speeches and presentations that encourage improved engagement between different sectors of the publishing community. The Startup Showcase took up part of the proceedings at Contec, with five publishing startups from around the world chosen as finalists. After short presentations from each of the finalists, Paperight was named as the winner of the showcase, with PubCoder from Italy named as the runner-up. The win rounds off a year of success for Paperight in international publishing innovation awards, including winning Most Entrepreneurial Startup at the O’Reilly Tools of Change Startup Showcase in New York City, as well as taking first place at the Digital Minds Innovation Awards at London Book Fair, both earlier this year. Paperight is also currently one of five finalists in the Accenture Innovation Index awards in South Africa. Posted on 9 October 2013 Author Nick MulgrewCategories UncategorizedLeave a comment on Paperight wins at CONTEC Startup Showcase at Frankfurt Book Fair! Getting to grips with marketing Paperight to your customers can seem daunting at first. The first thing, of course, is that most people don’t expect a copy shop to be a bookstore! But why shouldn’t they be? After all, Paperight outlets offer the quickest and cheapest way to get books to readers – especially important when it comes to educational books. There is no right or wrong way to spread the word about Paperight at your shop. In fact, there are loads of options out there! We recommend trying as many as possible to see what works best for your area. 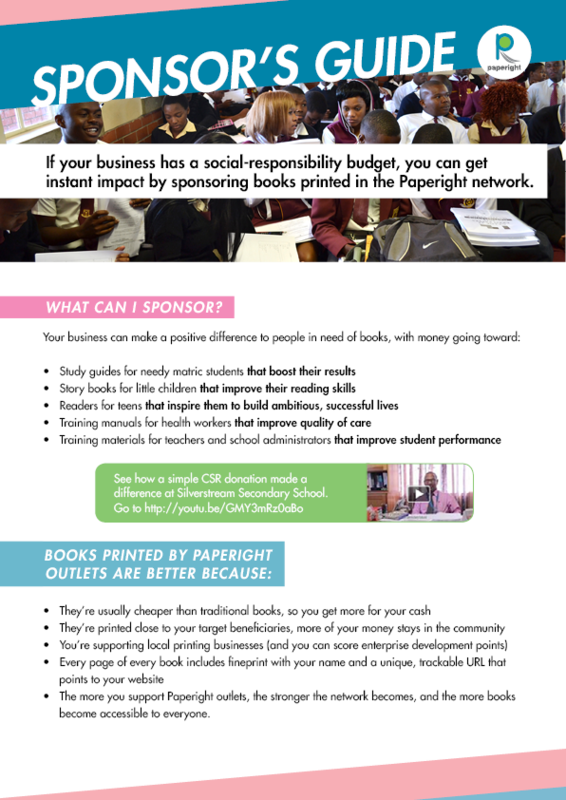 To get you started, here are a few pointers on what some of our Paperight partners have been up to. An outlet owner in George has worked hard to have his business featured in local community newspapers. His exposure has been a mixture of paid advertising and personal interest stories based on his work with the community. He is now the most successful Paperight partner in the area. Paperight hopes to address important social issues, but the added bonus is that it can be lucrative for outlets too! 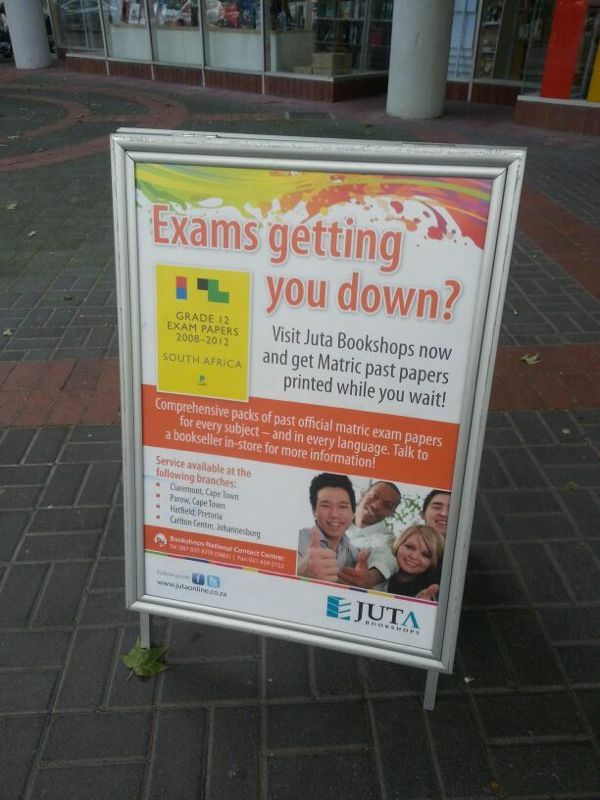 Two competing Paperight outlets in Cape Town have taken their advertising out of the store and onto the street. One has dedicated an entire shop window to advertising matric study aids on Paperight, such as Oxford University Press study guides and matric exam past papers. The window faces a busy intersection and has already resulted in an increase in walk-in customers asking for Paperight titles. Another store in the area has put out a Paperight-branded sandwich board on the sidewalk to let their customers know that they’re also selling books printed. As always, we have our poster archive and flyers to help you tell everyone that you’re a Paperight partner. And if you need any materials designed for your business, get in touch with our creative team here. PYWA13 launch at Open Book! On 7 September, we launched our Paperight Young Writers’ Anthology 2013 at a beautiful event during the Open Book Festival in Cape Town. Our event, titled “Young Writers, Big Futures”, featured a panel discussion that reflected on the importance of young writing in South Africa, as well as the process and results of creating a multilingual anthology. We also invited some of our young writers to give readings of their published work! Paperight CEO Arthur Attwell hosted the discussion between essays judge Hedley Twidle, poetry judge Sarah Rowan, acclaimed author and foreword author Niq Mhlongo, and the anthology’s editor, Oscar Masinyana. The atmosphere was contagious with the happy murmuring of the contributors, their families, friends and teachers. Members of the public who arrived to hear what the youth of today is getting up to left the Fugard Theatre with a far more positive outlook. The youth are speaking up, and what they are saying is valuable. To see our beautiful photos from the evening, click here, and click here for another perspective on the evening from SLiPnet’s Naydeen Fisher. And – if you’re a Paperight outlet – click here you’ll find a poster to put up in your store advertising the anthology to your young customers! Here are videos from the heart-warming event. Introducing the Paperight Tillpoint Checklist! We’ve tried to make the Paperight website as easy to use as possible for our outlets. But sometimes in the heat of sales, you might forget something important: How do I find a book? How do I calculate costs? How do I customise the book for the customer? But no fear anymore! We’ve made a handy tillpoint checklist that Paperight outlets can print up and stick at their point-of-sales terminals to help guide you through the sales process. It’s a step-by-step tool to help your staff from first contact with the customer to giving them a brand-new Paperight book, with minimal fuss and confusion. And, if you still hit a snag, there are our contact details right there, so don’t panic. You can find our awesome tillpoint checklist here. Posted on 30 August 2013 Author Nick MulgrewCategories Uncategorized1 Comment on Introducing the Paperight Tillpoint Checklist! If you’ve asked us for books in A5 format before, you’ll be relieved to know we can finally say yes! We know that A5 books are easier to read, nicer to own, and therefore better to promote in your copy shop. Till now, Paperight outlets have only been able to download A4 documents for printing. Most come two-up (two pages on one side of paper), which is very quick and cheap to print, but can’t be cut in half to make a neat little A5 book, because the page imposition doesn’t work. A4 is great for educational books and course readers. And A5 is best for books like novels, biographies, and many children’s books. Once downloaded, you can print these A5 documents using your print driver’s ‘booklet’ print setting. It will take us some time to add the A5 option to all of our books. Our content team has to prepare over a thousand A5 documents for this, and it’ll take some time to get to them all. So if the A5 option isn’t yet available for the book you need to print, let us know and we’ll push that book to the front of the queue.